Double Dark Chocolate Mint Chip Cookies were a selfish move on multiple levels. One: Ben is cuckoo and doesn’t like the dreamy medley of chocolate and mint. Fully aware of this gap in his sanity, I baked them anyway. Two: I skipped the hassle of deluding myself that I’d enjoy a few at home, then tote the remainder to the office. Why expend effort on pretense when I can put that energy towards more effective ends—such as pouring myself a second glass of milk to accompany Cookie #4? I blame my Christmas tree. Decorating my beloved little Charlie Brown number would not feel complete without cookies in the oven and carols the background. Here’s a snippet of my tree décor. My faithful pine hails from my single lady days and is probably the girliest tree you’ve ever seen. Yes, those are sequins on my tree skirt and glitter on my ornaments. Aren’t they pretty? 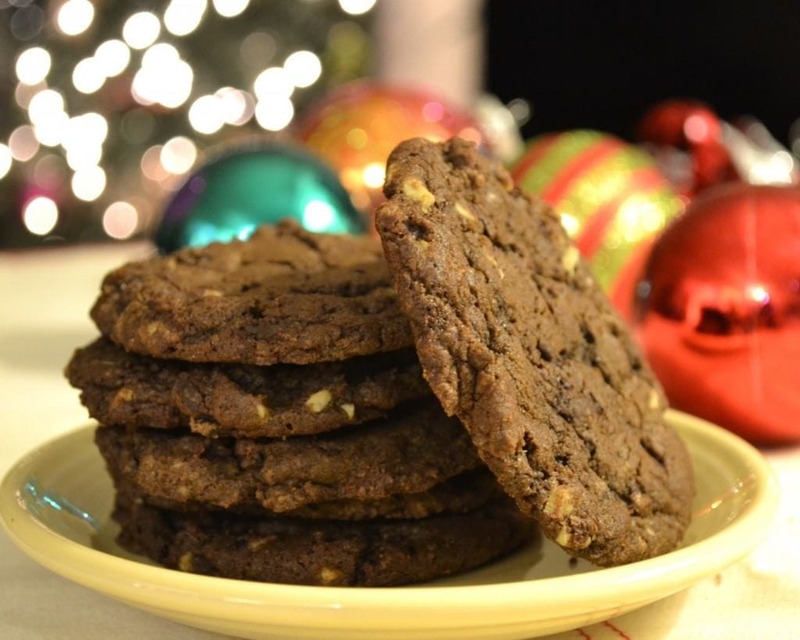 Double Dark Chocolate Mint Chip Cookies are exactly what you’d crave after completing the herculean task of untangling strands of Christmas tree lights. Then, you’d need seconds (and thirds) to celebrate the placing star on top. The fourth cookie is just because your tree is lovely and so are you. Since I inhabit camp more chocolate is better than less, these Double Dark Chocolate Mint Chip Cookies receive two hits: first from cocoa powder, then from chopped bittersweet chocolate. Next, mint baking chips arrive (think finely chopped Andes mints), adding a cool, sweet flavor that balances the dark chocolate and ensures that consumption will, under no circumstances, be limited to one cookie. Santa might leave you his entire bag of toys for a plate of Double Dark Chocolate Mint Chip Cookies, but you won’t part with them. Hide them under your bed beside the presents, and don’t be surprised if a red-suited someone sneaks into your pantry! PS. Don’t forget to enter here for a chance to win the handmade apron of your choice from a unique Etsy shop! 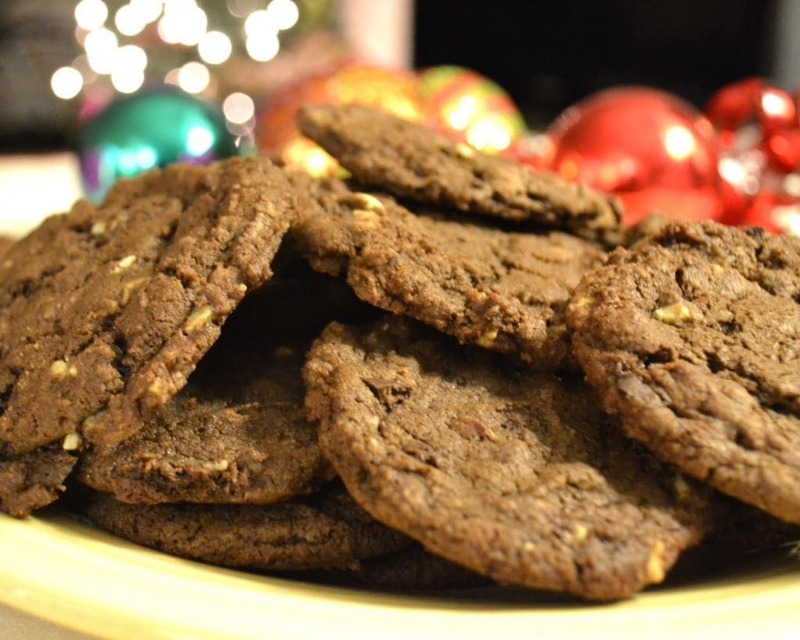 Best dark chocolate mint cookie recipe. Great for holiday baking and positively addictive. 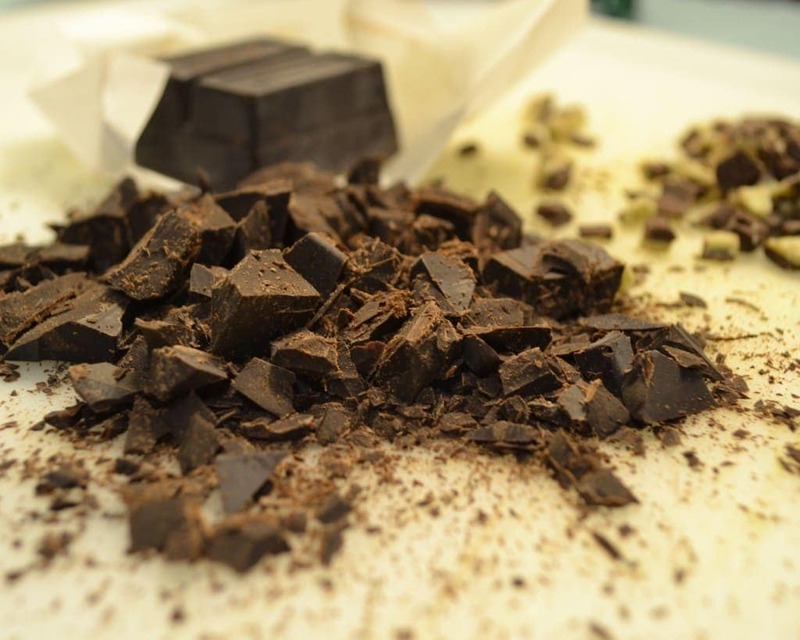 Uses dark chocolate and Andes mint chips. Cream the butter and both sugars until light and fluffy. Add the vanilla and egg. Mix well. Add the cocoa and mix again. Sift together the flour, baking soda, baking powder, and salt and add to the chocolate, mixing at low speed just until combined. Fold in the chopped bakers chocolate and mint chips. Drop the dough by rounded tablespoons on a cookie sheet lined with parchment paper. Lightly dampen your hands and flatten the dough slightly. Bake for exactly 11 minutes (the cookies will seem underdone). Remove from the oven and let cool on the pan for 1 minute, then transfer to a wire rack to cool completely. this is the most beautiful post I have ever seen!!! Thanks so much Elizabeth! That is so sweet of you! I am also in the more chocolate the better club :) These cookies look amazing. My sister is a huge Andes mint fan so I think a batch of these will be going in her Christmas package this year! We are twins in our chocolate love Becky. Also, I think you might just be the best sister ever! Mint and chocolate are my favorite flavor combinations as well!!!! Well it’s hard to choose, banana+chocolate or mint+chocolate! Yummmmyy!!!! Oh yum! Dark Chocolate + Mint = Perfect Combo! These look so good! I have some mint/dark chocolate chips that would be great in these cookies! BTW, the new site design looks great! Thanks so much!!! And YES, those chips sound like they are made for these cookies. Let me know if you try them! They look so good and anything adapted from Ina and made with Andes chips is a total win! i love mint in my deserts…love!!!!!! Me too Angela!! I know Ben isn’t a fan, but really, I just can’t stop myself. I’m totally on the chocolate and mint train this year. And I agree, the more chocolate the better! These cookies look and sound amazing! Jess, I’m glad you are in my chocolate camp! And when you add mint too, I think it just tastes like Christmas :-) Thanks for your comment! thanks a lot erin !!!!!! i am really eager to try this amazing recipie of yours. Your secret is safe with me Dionne! Thanks so much. I’m always looking for mint and chocolate combos thanks,Erin! These sound seriously yummy. I’ve been looking for a chocolate mint cookie! 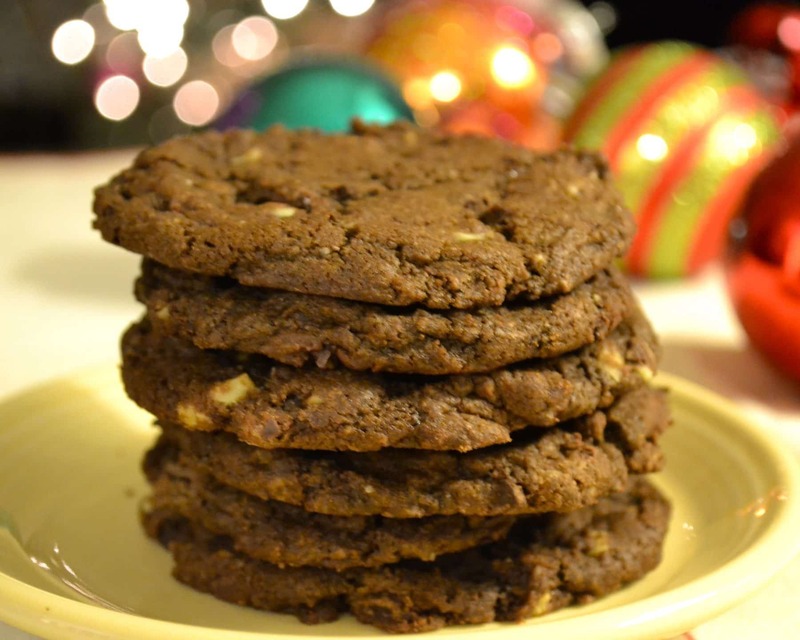 If you are craving chocolate and mint Karen, these cookies have your name all over them! I love having them with a glass of milk or cup of hot chocolate. Extra special Christmas cookies with the mint. These sounds delicious!! Oh heck yeah! Since I had some nice 99% cacao Scharffenberger bars and some ground Cacao Nibs left over from an epic Thanksgiving Turkey Mole’ I threw them in along with some Droste cocoa powder the Andes Mints & just a few drops of Peppermint extract. They came out pretty intense and almost needed a nice sturdy Zinfandel rather than a glass of ice cold milk. I might cut out the Cacao Nibs next time & increase the vanilla to smooth things out but these were SO tasty! Two dozen, gone in a weekend. Bill, it sounds like you went all out with these cookies, and I love it! SO happy to hear that you enjoyed them. I’ve never tried Scharffenberger chocolate, but I hear amazing things. Maybe Santa will bring me some? I love all of the flavor you put into these cookies, and I wouldn’t mind a plate of them with a glass of Zin one bit. 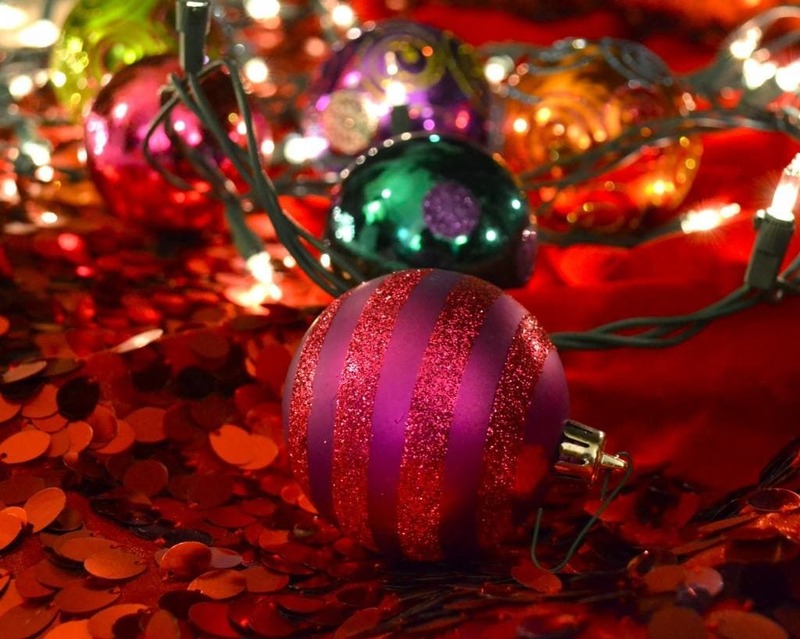 Have a very happy holiday and thanks so much for sharing your review!! I’ll have to send you the recipe for my Dark Chocolate Mochoa Mousse Souffle cake. Think a flour-less cake but with a few Tbs. of flour, cayenne pepper, espresso & just a smidge of brandy.